Brian Gionta of Team USA spoke to the media on Monday in PyeongChang. PYEONGCHANG, South Korea — Who really knows what 39 is supposed to look like anymore, but whatever it is, I feel safe in saying Brian Gionta doesn’t look it, nary a gray dotting his close-cropped dark hair or full beard. The captain of the US men’s hockey squad insisted Monday he doesn’t feel it either. That doesn’t mean he won’t hear about it. It’s not enough that Gionta is the oldest American competitor in PyeongChang; the 16-year NHL veteran is also shepherding a team without active NHL players, a collection of newbies that aren’t just mathematically young enough to be his son, but includes one player whose dad Gionta did play with in the past. Still, age has its perks. “We are in a group of five in the village, three bedrooms, and I did get my own room. 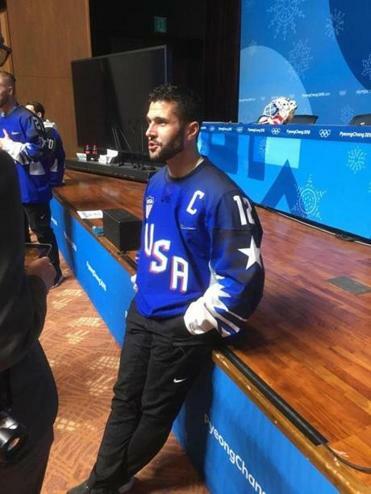 That is one of the upsides of being older,” said Gionta, legs dangling over the edge of the stage where his team’s news conference was held in advance of its first game Wednesday against Slovenia. Gionta spent the 2016-17 NHL season in Buffalo, closest to his hometown of Rochester, N.Y. But without another contract for the current season and unwilling to uproot his family one more time to pursue other NHL offers, he jumped on the invite from USA Hockey to return to their program. A veteran of the US team that finished a disappointing eighth in Turin 12 years ago, Gionta was grateful for an opportunity to fill the only hole on a hockey résumé that includes an NCAA championship with Boston College and a Stanley Cup with the New Jersey Devils. He trained and played with the Sabres’ AHL team to get ready for South Korea, and in the meantime, enjoyed being a full-time dad to his and his wife Harvest’s three children. There are three Gionta kids under the age of 12, so the family didn’t make the long trip to South Korea. The kids did gain an excuse to miss school, though. Gionta is the one playing the role of teacher here, inspiring teammates such as Boston University star Jordan Greenway or Harvard standout Ryan Donato with his work ethic and attitude. It was Ryan’s dad, Ted, whom Gionta played with early in his career. Curiosity about how these new teammates will come together has come out as skepticism in many corners of the hockey world, and with a mere four practices together since arriving at the Olympics to get ready for the first puck drop, the questions are not unfair. Yet as coach Tony Granato kept insisting Monday, this is the way teams are always put together for international tournaments, with video instructions sent out ahead of time, text chains ongoing among teammates, and roles well planned out by the time players convene on the ice.